There will be only one (last) round of the Regular Season in Liga Metropolitana. Here is the last round review presented by ESL. The most exciting game of round 18 in the Liga Metropolitana took place in Amatitlan. This derby game ended with only three-point home defeat of 4th ranked Amatitlan (5-3) to seventh ranked Laminas C. (3-5) 69-66 on Thursday evening. It was a good game for forward Alejandro Izaguirre (191-87) who led his team to a victory with 20 points and 6 rebounds. Ruben Rodriguez contributed with 10 points and 6 rebounds for the winners. 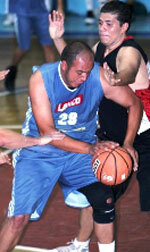 Walter Gasparico (-89) replied with a double-double by scoring 19 points and 12 rebounds for Amatitlan. Laminas C. moved-up to sixth place, which they share with Villa Nueva. Amatitlan at the other side keeps the fourth position with three games lost. Another interesting game was a derby match between two teams from Guatemala: USAC (#2) and URL (#8). URL was smashed at home by 33 points 52-85 and even the fact of playing on their own court did not help. The former international swingman Miguel Gonzalez (187-90) scored 17 points, 7 rebounds, 8 assists and 5 steals to lead the charge for the winners and Pablo Gonzalez chipped in 18 points and 9 rebounds during the contest. USAC's coach felt very confident that he used 11 players which allowed the starters a little rest for the next games. The best for the losing side was Rudy Morales (-99) with 13 points, 5 rebounds and 4 assists. Undefeated USAC (6-0) have an impressive six-game winning streak. They maintain second position with a perfect record of 6 victories in a row behind leader ELOHIM. URL lost third consecutive game. They dropped to the ninth place with five games lost. USAC will have a break next round, and it should allow them to practice more before next game. URL will play against Club Force (#3) to get more than just one victory in their record. The game in Guatemala was also quite interesting. Fourth ranked Amatitlan (5-3) played at the court of 8th ranked URL (1-5). Amatitlan managed to secure a 6-point victory 91-85 on Thursday. David Goddard notched a double-double by scoring 29 points and 12 rebounds to lead the effort. Even a double-double of 15 points and 12 rebounds by Luis Perez did not help to save the game for URL. 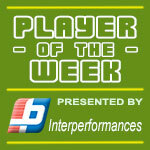 Amatitlan maintains fourth position with 5-3 record. URL lost third consecutive game. They dropped to the ninth place with five games lost. Amatitlan will have a break next round, and it should allow them to practice more before next game. URL will play against Club Force (#3) and hope to win that game. In the last two games of round 18 GMS was smashed by Club Force on the road 81-58. Club Force destroyed GMS on its own court 81-58. 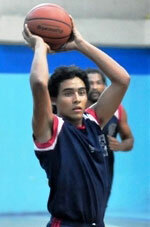 The most impressive performance of 18th round was 29 points and 5 assists by Walter Ramirez of Amatitlan. Another interesting game was a derby match between two teams from Guatemala: USAC (#2) and URL (#8). URL was smashed at home by 33 points 52-85 and even the fact of playing on their own court did not help. USAC dominated down low during the game scoring 60 of its points in the paint compared to URL's 24. They also forced 33 URL turnovers and outrebounded them 46-25 including a 20-6 advantage in offensive rebounds. USAC players were unselfish on offense dishing 25 assists comparing to just 11 passes made by URL's players. The former international swingman Miguel Gonzalez (187-90) scored 17 points, 7 rebounds, 8 assists and 5 steals to lead the charge for the winners and the former international swingman Pablo Gonzalez (194-89) chipped in 18 points and 9 rebounds during the contest. Five USAC players scored in double figures. USAC's coach felt very confident that he used 11 players which allowed the starters a little rest for the next games. The best for the losing side was Rudy Morales (-99) with 13 points, 5 rebounds and 4 assists and guard Luis Menendez (179-95) scored 16 points. USAC (6-0) have an impressive six-game winning streak. They maintain second position with a perfect record of 6 victories in a row behind leader ELOHIM. URL lost third consecutive game. They dropped to the ninth place with five games lost. USAC will have a break next round, and it should allow them to practice more before next game. URL will play against Club Force (#3) to get more than just one victory in their record. The most exciting game of round 18 in the Liga Metropolitana took place in Amatitlan. This derby game ended with only three-point home defeat of 4th ranked Amatitlan (5-3) to seventh ranked Laminas C. (3-5) 69-66 on Thursday evening. It was a good game for forward Alejandro Izaguirre (191-87) who led his team to a victory with 20 points and 6 rebounds. Ruben Rodriguez contributed with 10 points and 6 rebounds for the winners. Walter Gasparico (-89) replied with a double-double by scoring 19 points and 12 rebounds and naturalized American guard David Goddard (185-89) added 17 points, 9 rebounds and 4 assists in the effort for Amatitlan. Laminas C. moved-up to sixth place, which they share with Villa Nueva. Amatitlan at the other side keeps the fourth position with three games lost. The game between closely ranked teams ended with fourth ranked Club Force's (6-3) home victory over 5th ranked GMS (3-4) 81-58 on Tuesday. Club Force had a 41-22 advantage in offensive rebounds. Forward Hector Chur (179) notched 27 points and 9 rebounds to lead the effort and Linkin Fernandez supported him with 20 points and 12 rebounds. Even a double-double of 20 points, 10 rebounds, 6 assists and 4 steals by Erick Palma (-80) did not help to save the game for GMS. Guard Julio Oliva (183-99) added 9 points and 8 rebounds. Club Force have a solid three-game winning streak. They moved-up to third place. Loser GMS keeps the fifth position with four games lost. Club Force will meet at home URL (#9) in the next round where they are favorite. GMS will play against URL (#9) and hope to secure a win. The game between closely ranked teams ended with 5th ranked GMS's (3-4) road loss to fourth ranked Club Force (6-3) 58-81 on Thursday. Club Force had a 41-22 advantage in offensive rebounds. Forward Hector Chur (179) notched 27 points and 9 rebounds to lead the effort and Linkin Fernandez supported him with 20 points and 12 rebounds. Even a double-double of 20 points, 10 rebounds, 6 assists and 4 steals by Erick Palma (-80) did not help to save the game for GMS. Guard Julio Oliva (183-99) added 9 points and 8 rebounds. Club Force have a solid three-game winning streak. They moved-up to third place. Loser GMS keeps the fifth position with four games lost. Club Force will meet at home URL (#9) in the next round where they are favorite. GMS will play against URL (#9) and hope to secure a win. The game in Guatemala was also quite interesting. Fourth ranked Amatitlan (5-3) played at the court of 8th ranked URL (1-5). Amatitlan managed to secure a 6-point victory 91-85 on Thursday. Naturalized American guard David Goddard (185-89) notched a double-double by scoring 29 points and 12 rebounds to lead the effort and Walter Ramirez (-97) supported him with 29 points and 5 assists. Even a double-double of 15 points and 12 rebounds by Salvadorean guard Luis Perez (185-95) did not help to save the game for URL. Forward Luis Perez (191-97) added 18 points and 6 rebounds. Both teams had four players each who scored in double figures. Amatitlan maintains fourth position with 5-3 record. URL lost third consecutive game. They dropped to the ninth place with five games lost. Amatitlan will have a break next round, and it should allow them to practice more before next game. URL will play against Club Force (#3) and hope to win that game.